Picture - Dassault Mystx�re IVA No.121 preserved at the City of Norwich Aviation Museum. The Dassault MD.454 Mystx�re IV was a 1950s French fighter-bomber aircraft, the first transonic aircraft to enter service in French Air Force. The Mystx�re IV was an evolutionary development of the Mystx�re II aircraft. Although bearing an external resemblance to the earlier aircraft, the Mystx�re IV was in fact a new design with aerodynamic improvements for supersonic flight. The prototype first flew on 28 September 1952, and the aircraft entered service in April 1953. The first 50 Mystere IVA production aircraft were powered by British Rolls-Royce Tay turbojets, while the remainder had the French-built Hispano-Suiza Verdon 350 version of that engine. Israeli Mystx�re IVs saw action during the Arab-Israeli Wars and were joined by the French Mystx�res for the Suez crisis. France was the main operator of the Mystere IV and at the peak usage operated 6 squadrons. Most of the aircraft were purchased under a United States Offshore Procurement contract and many were returned to US custody after they were retired. In April 1953 the United States government and the United States Air Force placed an order for 223 aircraft to be operated by the French. The new Mystere IVs were used in the 1956 Suez Crisis and continued in use into the 1980s. On 30 October 1956 the Mystere IV gets its first kill when eight aircraft were in combat with 12 Egyptian Air Force MiG-15s. The Mysteres shot down one MiG and damaged a second. In the following days two Mysteres engaged four Egyptian De Havilland Vampires and destroyed them all. On 8 June 1967 Israeli aircraft were involved in the controversial attack on the USS Liberty. India procured 104 of aircraft in 1957 and it was used extensively in the Indo-Pakistani War of 1965. On 16 Sept 65 a Mystere IVA shot down a Pakistani L-19. On 7 September 1965 an Indian Mystere shot down a Pakistani Lockheed F-104 Starfighter in a raid over Sargoda. The Mystere pilot Devayya was later awarded the Maha Vir Chakra posthumously 23 years after the battle. During the campaign Mystx�re IVs also destroyed Pakistani aircraft on the ground including four F-86F, three F-104 and 2 Lockheed C-130 Hercules transports. The phasing out of the aircraft started soon after the 1965 Indo-Pakistani War, but it saw further action in the Indo-Pakistani War of 1971 but was completely phased out of the Indian Air Force by 1973. Mystere IV Prototype powered by a Rolls-Royce Tay 250 engine Mystere IVA Production fighter-bomber, 421 built, first 50 with the Rolls-Royce Tay 250 the remaining 371 with a French derivative of the Tay, the Hispano-Suiza Verdon. Mystere IVB In addition to production Mystx�re IVA, Dassault developed an upgraded Mystx�re IVB with either Rolls-Royce Avon (first two prototypes) or SNECMA Atar 101 (third prototype) afterburning engine and a radar ranging gunsight. Six pre-production aircraft were built but the project was abandoned in favour of the promising Super Mystx�re. Mystere IVN Dassault also proposed a two-seat all-weather interceptor version called Mystx�re IVN. The aircraft was equipped with the AN/APG-33 radar in an arrangement similar to North American F-86D Sabre Dog, powered by a Rolls-Royce Avon turbojet, and armed with 55x� 68 mm Matra rockets in a retractable belly tray. The first prototype flew on 19 July 1954. AdA eventually decided to purchase Sud Aviation Vautour and F-86K Sabre for the interceptor role but the Mystx�re IVN prototype continued to fly for several years as a testbed for radar equipment. Kopenhagen, W (editor) (1987). Das grox�e Flugzeug-Typenbuch. Transpress. ISBN 3-3440-0162-0. 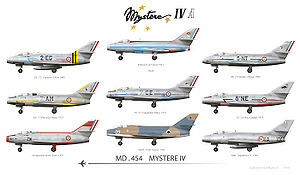 Dassault Mystere IV Pictures and Dassault Mystere IV for Sale.